Yes, I’ve been MIA…sorry about that! Time for a new posting! Over at Splitcoast yesterday…the Technique Lovers Challenge to make tags and the Color Challenge today is Kraft, White and Pear Pizzazz. I’ve used a die to cut out my tag. Next comes some sponging with Shabby Shutters and then I dabbed on some Snow Cap acrylic paint around the edges. Next comes a few images stamped in Shabby Shutters, followed by more images from the same set stamped in the acrylic paint. 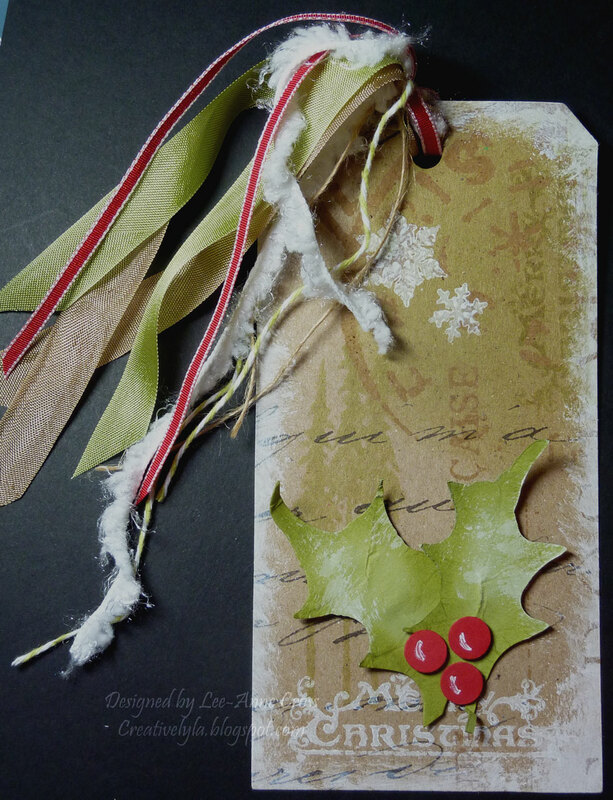 The holly leaves are die cut, shaped with a stylus, edged in Shabby Shutters and dabbed with Snow Cap which was then smudged with my fingers. The little holly berries have a bit of white gel pen for interest. And finally, I tied a bunch of fibers to the top of the tag with some burlap string.